Items where Author is "Krahmann, Gerd"
von Appen, W. J., Koszalka, I. M. , Pickart, R. S., Haine, T. W. N., Mastropole, D., Magaldi, M. G., Valdimarsson, H., Girton, J., Jochumsen, K. and Krahmann, G. (2014) The East Greenland Spill Jet as an important component of the Atlantic Meridional Overturning Circulation. Deep Sea Research Part I: Oceanographic Research Papers, 92 . pp. 75-84. DOI 10.1016/j.dsr.2014.06.002. Patara, L. , Visbeck, M. , Masina, S., Krahmann, G. and Vichi, M. (2011) Marine biogeochemical responses to the North Atlantic Oscillation in a coupled climate model. Journal of Geophysical Research: Oceans, 116 (C7). C07023. DOI 10.1029/2010JC006785. Papenberg, C. , Klaeschen, D. , Krahmann, G. and Hobbs, R. W. (2010) Ocean temperature and salinity inverted from combined hydrographic and seismic data. Geophysical Research Letters, 37 (4). L04601. DOI 10.1029/2009GL042115. Klaeschen, D. , Hobbs, R. W., Krahmann, G. , Papenberg, C. and Vsemirnova, E. (2009) Estimating movement of reflectors in the water column using seismic oceanography. Geophysical Research Letters, 36 . L00D03. DOI 10.1029/2009GL038973. Krahmann, G. , Papenberg, C. , Brandt, P. and Vogt, M. (2009) Evaluation of seismic reflector slopes with a Yoyo-CTD. Geophysical Research Letters, 36 . L00D02. DOI 10.1029/2009GL038964. Krahmann, G. , Brandt, P. , Klaeschen, D. and Reston, T. J. (2008) Mid-depth internal wave energy off the Iberian Peninsula estimated from seismic reflection data. Journal of Geophysical Research: Oceans, 113 . C12016. DOI 10.1029/2007JC004678. Krahmann, G. and Visbeck, M. (2003) Arctic Ocean sea ice response to Northern Annular Mode-like wind forcing. Geophysical Research Letters, 30 (15). 1793,. DOI 10.1029/2003GL017354. Krahmann, G. and Visbeck, M. (2003) Variability of the Northern Annular Mode's signature in winter sea ice concentration. Polar Research, 22 (1). pp. 51-57. Krahmann, G. , Visbeck, M. , Smethie, W., D'Asaro, E. A., Rhines, P. B., Clarke, R. A., Lazier, J., Davis, R. E., Niiler, P. P., Guest, P. S., Meincke, J., Moore, K. G. W., Pickart, R. S., Brechner Owens, W., Prater, M. D., Renfrew, I. A. and Schott, F. (2003) The Labrador Sea Deep Convection Experiment data collection. Geochemistry, Geophysics, Geosystems, 4 (10). p. 1091. DOI 10.1029/2003GC000536. Krahmann, G. , Visbeck, M. and Reverdin, G. (2001) Formation and propagation of temperature anomalies along the North Atlantic Current. Journal of Physical Oceanography, 31 . pp. 1287-1303. DOI 10.1175/1520-0485(2001)031<1287:FAPOTA>2.0.CO;2. Krahmann, G. , Schott, F. and Send, U. (2000) Seasonal heat content changes in the western Mediterranean Sea as a means for evaluating surface heat flux formulations. Journal of Geophysical Research: Oceans, 105 (C7). pp. 16941-16950. DOI 10.1029/2000JC900039. Seager, R., Kushnir, Y., Visbeck, M. , Naik, N., Miller, J., Krahmann, G. and Cullen, H. (2000) Causes of Atlantic Ocean climate variability between 1958 and 1998. Journal of Climate, 13 . pp. 2845-2862. DOI 10.1175/1520-0442(2000)013<2845:COAOCV>2.0.CO;2. Rhein, M., Send, U., Klein, B. and Krahmann, G. (1999) Interbasin deep water exchange in the western Mediterranean. Journal of Geophysical Research: Oceans, 104 (C10). 23,495-23,508. DOI 10.1029/1999JC900162. Send, U., Font, J., Krahmann, G. , Millot, C., Rhein, M. and Tintore, J. (1999) Recent advances in observing the physical oceanography of the western Mediterranean Sea. Progress in Oceanography, 44 . pp. 37-64. DOI 10.1016/S0079-6611(99)00020-8. Krahmann, G. and Schott, F. (1998) Longterm increases in western Mediteranean salinities and temperatures: a mixture of anthropogenic and climate sources. Geophysical Research Letters, 25 (22). pp. 4209-4212. DOI 10.1029/1998GL900143. Rhein, M., Stramma, L. and Krahmann, G. (1998) The spreading of Antarctic bottom water in the tropical Atlantic. Deep Sea Research Part I: Oceanographic Research Papers, 45 (4-5). pp. 507-527. DOI 10.1016/S0967-0637(97)00030-7. Visbeck, M. , Cullen, H., Krahmann, G. and Naik, N. (1998) An ocean model's response to North Atlantic Oscillation like wind forcing. Geophysical Research Letters, 25 . pp. 4521-4524. DOI 10.1029/1998GL900162. Send, U., Krahmann, G. , Mauuary, D., Desaubies, Y., Gaillard, F., Terre, T., Papadakis, J., Taroudakis, M., Skarsoulis, E. and Millot, C. (1997) Acoustic observations of heat content across the Mediterranean Sea. Nature, 385 . pp. 615-617. DOI 10.1038/385615a0. Cheah, W., Taylor, B. B., Wiegmann, S., Raimund, S., Krahmann, G. , Quack, B. and Bracher, A. (2013) Photophysiological state of natural phytoplankton communities in the South China Sea and Sulu Sea. Biogeosciences Discussions, 10 (7). pp. 12115-12153. DOI 10.5194/bgd-10-12115-2013. Krahmann, G. and Papenberg, C. (2011) Deep echoes: an interdisciplinary approach to investigate the oceans. IFM-GEOMAR Annual Report, 2010 . pp. 20-21. Jung, T., Kurcharski, F., Visbeck, M. and Krahmann, G. (2008) Wechselwirkung der NAO mit dem Ozean und Meereis / Interaction of the NAO with the ocean and sea ice. Promet - Meteorologische Fortbildung, 34 (3/4). pp. 113-121. Visbeck, M. , Gordon, A. L., Smethie, B., Schlosser, P., Toole, J., Huber, B. and Krahmann, G. (2001) The CORC/ARCHES observing system for Weddell Sea Deep and Bottom Water Variability. CLIVAR Exchanges, 22 (6 (4)). pp. 23-25. Schott, F., Send, U., Krahmann, G. , Mertens, C., Rhein, M., Visbeck, M. , Desaubies, Y., Gaillard, F., Terre, T., Taroudakis, M., Athanassoulis, G. and Skarsoulis, E. and The THETIS Group (1994) Open-ocean deep convection explored in the Mediterranean. Eos, Transactions American Geophysical Union, 75 . pp. 217-219. DOI 10.1029/94EO00893. Visbeck, M. , Chassignet, E., Curry, R., Delworth, T., Dickson, B. and Krahmann, G. (2003) The Ocean's Response to North Atlantic Oscillation Variability. In: The North Atlantic Oscillation: Climate Significance and Environmental Impact. , ed. by Hurrell, J. W., Kushnir, Y., Ottersen, G. and Visbeck, M.. Geophysical Monograph Series, 134 . American Geophysical Union, Washington, DC, pp. 113-146. Send, U., Visbeck, M. and Krahmann, G. (1995) Aspects of acoustic transponder surveys and acoustic navigation. In: OCEANS '95. MTS/IEEE. Challenges of Our Changing Global Environment. Conference Proceedings. . IEEE, San Diego, Calif., pp. 1631-1642. DOI 10.1109/OCEANS.1995.528730. Dengler, M. , Hummels, R., Brandt, P. , Fischer, T. and Krahmann, G. (2014) Upper ocean mixing observations during TACE: Mixing processes in the equatorial Atlantic vs. Pacific. [Talk] In: Ocean Sciences Meeting 2014. , 23.-28.02.2014, Honululu, Hawaii, USA . Hahn, J., Fischer, T. , Brandt, P. , Greatbatch, R. J. , Körtzinger, A. , Tanhua, T. , Visbeck, M. , Banyte, D., Dengler, M. and Krahmann, G. (2014) Oxygen Supply to the Tropical North East Atlantic Oxygen Minimum Zone. [Talk] In: SFB754 Colloquium. , 08.01.2014, Kiel, Germany . Liblik, T., Fischer, J. , Bumke, K. and Krahmann, G. (2014) Coastal upwelling in the western Baltic Sea – combining glider survey and long time-series. [Talk] In: Measuring and modeling of Multi-Scale Interactions in the Marine Environment. , 26.-29.05.2014, Tallinn, Estonia . Thomsen, S. , Kanzow, T., Krahmann, G. , Dengler, M. , Greatbatch, R. J. and Lavik, G. (2014) Meso and submesoscale variability within the Peruvian upwelling regime observed by a fleet of seven gliders. [Talk] In: Institut Pierre Simon Laplace. , 10.10.2014, Paris, France . Fischer, T. , Hahn, J., Brandt, P. , Greatbatch, R. J. , Körtzinger, A. , Tanhua, T. , Visbeck, M. , Banyte, D., Dengler, M. and Krahmann, G. (2013) Oxygen Supply to the Tropical North East Atlantic Oxygen Minimum Zone. [Invited talk] In: IOW Colloquium. , 18.11.2013, Rostock, Germany . Dengler, M. , Krahmann, G. and Fischer, T. (2013) Variability of turbulent mixing and diapycnal solute fluxes in the Peruvian upwelling region: First results from Meteor Cruise M92. [Talk] In: Mini-Symposium at El Instituto del Mar del Perú (IMARPE). , 04.02.2013, Lima, Peru . Thomsen, S. , Kanzow, T. and Krahmann, G. (2013) The role of meso- and submesoscale processes for the near coastal oxygen supply into the oxygen minimum zone off Peru. [Talk] In: Warnemünde Turbulence Days 2013. , 13.08.2013, Vilm, Germany . Dengler, M. , Brandt, P. , McPhaden, M. J., Bourles, D., Thomsen, S. , Krahmann, G. , Fischer, T. and Hummels, R. (2012) Upper ocean mixing processes and their impact on the mixed layer heat balance during the onset of the Atlantic Cold Tongue. [Talk] In: Tropical Atlantic Variability Meeting / PIRATA-17 Meeting . , 10.-15.09.2012, Kiel, Germany . Krahmann, G. (2012) Interne Wellen in der Biskaya. [Talk] In: Schall und Schwingungen Turbulenz und Wellen in sensibler Umgebung . , 17.-20.09.2012, Kiel, Germany . Papenberg, C. , Klaeschen, D. , Krahmann, G. , Hobbs, R. and Vsemirnova, E. (2010) Recent advances in seismic oceanography. [Talk] In: EGU General Assembly. , 02.-07.05.2010, Vienna, Austria . Papenberg, C. , Klaeschen, D. , Krahmann, G. , Hobbs, R. and Visbeck, M. (2008) Vertical Seismic Profiling (VSP) In Seismic Oceanography - A Proof Of Concept. [Talk] In: Ocean Sciences Meeting. , 02.-07.12, Orlando, Florida, USA . Uenzelmann-Neben, G., Klaeschen, D. , Krahmann, G. , Reston, T. J. and Visbeck, M. (2008) Seismic reflections within the water column south of South Africa: indications for the Agulhas Retroflection. [Talk] In: ESF Seismic Oceanography Workshop 2008. , 19.-21.11, Begur, Spain . Uenzelmann-Neben, G., Klaeschen, D. , Krahmann, G. , Reston, T. J. and Visbeck, M. (2008) Seismic Reflections Within The Water Column South Of South Africa: Indications For The Agulhas Retroflection. [Talk] In: Ocean Sciences Meeting. , 02.-07.12, Orlando, Florida, USA . Vogt, M., Krahmann, G. , Papenberg, C. , Silva, P., Brandt, P. , Klaeschen, D. , Visbeck, M. and Hobbs, R. (2008) Combining CTD-Yoyo Data With Seismic Reflections. [Talk] In: Ocean Sciences Meeting. , 02.-07.12, Orlando, Florida, USA . Klaeschen, D. , Papenberg, C. , Reston, T. J., Krahmann, G. , Brandt, P. , Visbeck, M. and Oliveira, L. (2006) Seismic images and properties of a Meddy. [Other] In: AGU Fall Meeting. , 13.12, San Francisco, California, USA . Krahmann, G. (2006) Internal wave energy estimated from seismic reflection data. [Other] In: 13. Ocean Sciences Meeting. , 17.02.-01.03, Honolulu, Hawaii, USA . Krahmann, G. , Brandt, P. , Papenberg, C. , Klaeschen, D. , Visbeck, M. and Reston, T. J. (2006) Internal wave energy estimated from seismic reflection data. [Other] In: AGU Fall Meeting. , 11.12, San Francisco, California, USA . Uenzelmann-Neben, G., Klaeschen, D. , Krahmann, G. , Reston, T. J. and Visbeck, M. (2006) Reflections within the water column South of South Africa: indications for the Agulhas Retroflection. [Talk] In: AGU Fall Meeting. , 11.-15.12.2006, San Francisco, California, USA . Hahn, J., Brandt, P. and Krahmann, G. (2015) Meso- to submesoscale O2 variability in the oxygen minimum zone of the eastern tropical North Atlantic. [Poster] In: EGU General Assembly 2015. , 12.–17.04.2015 , Vienna, Austria . Thomsen, S. , Greatbatch, R. J. , Dengler, M. , Kanzow, T. and Krahmann, G. (2015) Near-inertial waves interacting with a coherent anticyclone off Peru. [Poster] In: Workshop on Energy transfers in Atmosphere and Ocean. , 20.-22.04.2015, Hamburg, Germany . 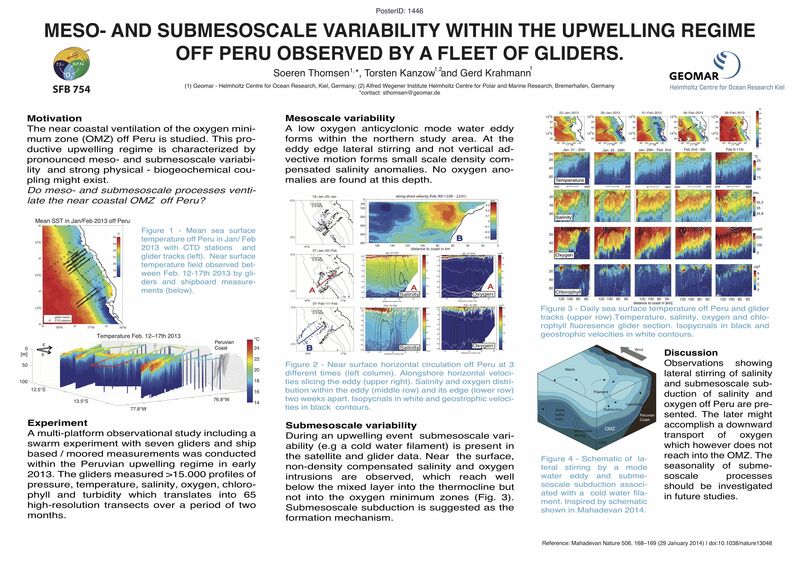 Thomsen, S. , Kanzow, T. and Krahmann, G. (2014) Meso and submesoscale variability within the upwelling regime off Peru observed by a fleet of gliders . [Poster] In: Ocean Sciences Meeting 2014. , 23.-28.02.2014, Honululu, Hawaii, USA . Thomsen, S. , Kanzow, T., Krahmann, G. , Dengler, M. and Krüger, M. (2014) The formation of an anticyclonic mode water eddy within the Peru-Chile Undercurrent. [Poster] In: EGU General Assembly 2014. , 27.04.-02.05.2014, Vienna, Austria . Fischer, T. , Banyte, D., Brandt, P. , Dengler, M. , Krahmann, G. , Tanhua, T. and Visbeck, M. (2013) Diapycnal oxygen supply to the tropical North Atlantic oxygen minimum zone (OMZ). [Poster] In: EGU General Assembly 2013. , 07.-12.04.2013, Vienna, Austria . Hahn, J., Brandt, P. , Greatbatch, R. J. , Krahmann, G. and Körtzinger, A. (2013) O2 variability and Meridional Oxygen Supply in the Tropical North East Atlantic Oxygen Minimum Zone. [Poster] In: EGU General Assembly 2013. , 07.-12.04.2013, Vienna, Austria . Hahn, J., Brandt, P. , Greatbatch, R. J. , Körtzinger, A. , Krahmann, G. and Funk, A. (2012) O2 variance at intermediate depth in the central tropical Atlantic along 23°W. [Poster] In: EGU General Assembly 2012. , 22.-27.04.2012, Vienna, Austria . Dengler, M. , Brandt, P. , Funk, A., Hormann, V., Greatbatch, R. J. , Fischer, T. , Krahmann, G. , Hummels, R. and Toole, J. M. (2012) The 4.5-year climate cycle and the mixed layer heat budget in the tropical Atlantic. [Poster] In: International Joint conference EU THOR and BMBF North Atlantic projects. , 24.-26.09.2012, Hamburg, Germany . Dengler, M. , Brandt, P. , McPhaden, M. J., Thomsen, S., Krahmann, G. , Fischer, T. , Freitag, P. and Hummels, R. (2012) Upper ocean mixing processes and their impact on the mixed layer heat balance during the onset of the Atlantic Cold Tongue. [Poster] In: EGU General Assembly 2012. , 22.-27.04.2012, Vienna, Austria . Krahmann, G. , Brandt, P. and Kanzow, T. (2012) Vertical velocities in the tropical Atlantic observed with autonomous gliders. [Poster] In: Ocean Sciences Meeting 2012. , 20.-24.02.2012, Salt Lake City, USA . Franz, J., Krahmann, G. , Lavik, G., Grasse, P. and Riebesell, U. (2011) Distribution of phytoplankton in the tropical Eastern South Pacific in relation to hydrographic and nutrient conditions. [Poster] In: EGU General Assembly 2011. , 03.-08.04.2011, Vienna, Austria . Patara, L. , Visbeck, M. , Masina, S., Krahmann, G. and Vichi, M. (2011) Marine biogeochemical responses to the North Atlantic Oscillation in a coupled climate model. [Poster] In: EGU General Assembly 2011. , 03.-08.04.2011, Vienna, Austria . Brandt, P. , Hormann, V., Körtzinger, A. , Visbeck, M. , Krahmann, G. , Stramma, L. , Lumpkin, R. and Schmid, C. (2010) Changes in the ventilation of the oxygen minimum zone of the tropical North Atlantic (PO15C-15). [Poster] In: Ocean Sciences Meeting 2010 "Oxygen Minimum Zones and Climate Change: Observations and Prediction IV". , 22.02.-26.02.2010, Portland, Oregon, USA . Karbe, F. R., Visbeck, M. , Krahmann, G. and Dengler, M. (2010) Performance of a high frequency lowered ADCP to infer finescale parameters. [Poster] In: EGU General Assembly 2010, Session NP6.1. , 07.05.2010, Vienna, Austria . Hobbs, R., Geli, L., Krahmann, G. , Vsemirnova, E. and Klaeschen, D. (2008) Multi-Spectral Seismic Images Of The Water Structure. [Poster] In: Ocean Sciences Meeting. , 02.-07.12, Orlando, Florida, USA . Klaeschen, D. , Papenberg, C. , Krahmann, G. and Hobbs, R. (2008) Vertical seismic profiling (VSP) in seismic oceanography - a proof of concept. [Poster] In: EGU General Assembly 2008. , 13.-18.04, Vienna, Austria . Klaeschen, D. , Sallares, V., Buffet, G., Papenberg, C. , Vogt, M., Krahmann, G. , Carbonell, R., Hobbs, R. and Visbeck, M. (2008) Seismic Images And Properties Of Mediterranean Outflow Water (MOW). [Poster] In: Ocean Sciences Meeting. , 02.-07.12, Orlando, Florida, USA . Uenzelmann-Neben, G., Klaeschen, D. , Krahmann, G. , Reston, T. J. and Visbeck, M. (2008) Seismic reflections within the water column south of South Africa: indications for the Agulhas Retroflection. [Poster] In: EGU General Assembly 2008. , 13.-18.04, Vienna, Austria . Uenzelmann-Neben, G., Klaeschen, D. , Krahmann, G. , Reston, T. J. and Visbeck, M. (2007) Indications for the Agulhas Return Current from reflections within the water column at the southern South African continental margin. [Poster] In: SAGA Biennial Technical Meeting & Exhibition. , 22.-26.10, Wild Coast Sun, South Africa . Papenberg, C. , Klaeschen, D. , Reston, T. J., Krahmann, G. , Brandt, P. , Visbeck, M. and Wagner, G. (2006) Seismic images of mixed water masses. [Poster] In: AGU Fall Meeting. , 11.12.-15.12, San Francisco, California, USA . Wagner, G., Reston, T. J., Klaeschen, D. , Krahmann, G. , Papenberg, C. , Brandt, P. and Visbeck, M. (2006) Seismic imaging of thermohaline fine structure in the eastern Atlantic. [Poster] In: DGG 66. Jahrestagung. , 06.03-09.03, Bremen . Krahmann, G. (1997) Saisonale und zwischenjährliche Variabilität im westlichen Mittelmeer - Analyse historischer Daten. (Doctoral thesis/PhD), Christian-Albrechts-Universität Kiel, Kiel, Germany, 168 pp. Brandt, P. , Arevalo-Martinez, D. L. , Bonou, F. K., Araujo Magalhaes, P. d., Dengler, M. , Didwischus, S. H., Hounsou-Gbo, G. A., Lüdke, J. , Kisjeloff, B., Krahmann, G. , de Novoto Macueria, M. F., Marandino, C. A., Müller, M., Niehus, G., Ostrovski, M., Papenburg, U., Pereira da Silva, M., Raeke, A., Rühs, S. , Schweizer, E., Steinhoff, T., Tchipalanga, P. C. M., Vasco, E. C., Vogel, B. and Zavarsky, A. (2014) Mixing and Circulation in the Tropical Atlantic Cruise No. M98. . METEOR-Berichte, M98 . DFG-Senatskommission für Ozeanographie, Bremen, Germany, 30 pp. DOI 10.2312/cr_m98. Brandt, P. , Alevara Martinez, D., Dengler, M. , Didwischus, S. H., Funk, A., Hahn, J., Hogue, B., Kemena, T., Kock, A., Krahmann, G. , Martens, W., Martogli, N., Müller, M., Niehus, G., Papenburg, U., Pinck, A., Rother, K., Schlundt, M., Schütte, F., Tippenhauer, S., Vogt, M. and Zantopp, R. J. (2012) Physical and Biogeochemical Studies in the Subtropical and Tropical Atlantic. . Maria S. Merian-Berichte . DFG Senatskommission für Ozeanographie, Hamburg, Germany, 41 pp. Krahmann, G. (2009) FS Poseidon Fahrtbericht / Cruise Report P350 [POS350]: Internal wave and mixing processes studied by contemporaneous hydropgraphic, current, and seismic measurements. , ed. by Krahmann, G., Papenberg, C., Funk, A. and Roth, C.. IFM-GEOMAR Report, 26 . IFM-GEOMAR, Kiel, 25 pp. DOI 10.3289/ifm-geomar_rep_26_2009. Dengler, M., Schafstall, J., Tanhua, T., Fiedler, B., Krahmann, G. and Löptin, U., eds. (2008) FS Poseidon Fahrtbericht / Cruise Report P347 [POS347]: Mauritanian Upwelling and Mixing Process Study. . IFM-GEOMAR Report, 16 . IFM-GEOMAR, Kiel, 28 pp. DOI 10.3289/ifm-geomar_rep_16_2008. This list was generated on Thu Apr 25 14:54:50 2019 CEST.